I wanted to share what I've been doing in the Dining Room to bring in some Fall color. Since I started using this old window box as my centerpiece on the Dining Room Table late last Spring, I've been trying to keep it looking "natural". That can be hard to do since I use faux ivy and flowers in it, but right now I'm just enjoying those wonderful muted Fall colors, trying to keep it simple. I did have to add in a few orange leaves just to get a little fix. I don't know if you can tell, but this is a REALLY BIG window box. OK, how many of you more mature people out here remember Ed Sullivan saying "it's going to be a really big sheeeew"? I know, I'm more mature...but that's what this is..."a really big window box"! So I have faux ivy, some styrofoam, leaf garland, and then because my pumpkins kept disappearing to the bottom, I grabbed some heavy brown paper grocery bags and wadded them up underneath...sheesh. at least now my pumpkins aren't doing a disappearing act. I've had these two inspiration images in my files forever. but love their natural look in the old chippy window boxes. Here's mine, no watering involved. My little cement boy cherub (that I found at the flea for $15) has joined in on the Fall Festivities. I've seen reproductions of him lately, but this little man in the real deal. and super heavy... heavy like...do I really want him on the table, kinda heavy. I'm working on the sitting area and Holiday Cupboard in the lower level today, so I'll be sharing that soon. My curiosity cabinet has been fun putting together this year. Ahhhhh... it's been wonderful here these last two days. sunny and in the 70's. Your windowbox is so pretty Debra, I just love it!... I want to re~do my daddy's old tool caddy I linked to your Fall posts last year in some more muted Autumn colors, like yours... loving the white pumpkins too!...of course I remember Ed Sullivan too... infact, I first saw Elvis Presley on it when I was a little girl!... it's fun being "mature"... we grew up in a much more innocent time... have fun with your Autumn decorating!... xoxo Julie Marie PS do you have any of your pretty rhinestone key pendants with a little squirrel on them?... or an acorn or such? Perfect for your table:) Have a blessed COOL Sunday morning, HUGS! This looks great, Debra! You have certainly gotten a lot of use with this window box. I've had that same disappearing problem with my wood tote and I used some paper shred. The white pumpkins works so well with the rest of your decor. Oh I love that look. Are all your pieces faux? Thanks for sharing. The window box centerpiece is so pretty on your table, along with the heavy angel, (maybe too heavy for the table) and the beautiful tureen. That centerpiece is so pretty and unique. I like large centerpieces on a table. I know you will enjoy your dining room even more this year with your new slipcovers. I love it! Oh, it is so pretty...you did a great job!! That is beautiful!!! I love oversize containers...love Fall....bring it on!!!! I too Love Decorating for Fall and the upcoming Holiday Seasons. Waiting for our Weather to Cool off again and revel in all of the Activities the changing Seasons bring! Your beautiful filled windowbox looks great on your table. Your dining room is gorgeous. You just put me in the mood for a pumpkin spice latte. My son got me a 25 dollar Starbucks gift card for my birthday so now I am set. Thanks for the prompting. How pretty and so inspiring...I love the muted colors! Debra - Love your centerpiece!! Those white pumpkins are so pretty. SO cute! You've inspired me to get started on my Fall things. Thanks for sharing your adorable idea. Love the old window box decorated for Fall...so very pretty!! Love your Autumn Window box!!! Subtle shades of Fall throughout! It has been gorgeous here On Crooked Creek and we're planting mums to replace those that didn't survive the Summer's drought! (Finally, our Lowe's got them in yesterday!!!) I chose burgundy and bronze! Thanks for sharing your inspiration and your completed Fall box with us! Your window box is so pretty! I love the natural elements you have displayed. What a creative vignette! I love what you're doing with all the fall decor! I need to get mine out. Maybe I'll start with putting my fall banner on my blog first. See... you got me off my duff. Have a great week! Very pretty Debra! I love the white pumpkins in there and LOVE your dining room! Gorgeous! inspirational photos we save and put them into action! to the store ! Yay ! Love your window box! Looks great with your natural fall decor! That statue is beautiful! I always shy away from faux flowers and ivy because my mom had a lot of it and It always got dusty but I am starting to dig it (in a faux dirt type of dig way....) I will always like fresh flowers but there are so many advantages to the fake flowers. . You have yours displayed soooo nicely. No one does fall better than you Debra! Wish I could have you come visit and help me out!! Very, very pretty! As well as the two inspirational pics. You make me wanna go grab my old tool caddy and paint it. Wow, it really is big and so beautiful! The window box is amazing. I love the white pumpkins. I am trying to get into fall but my flowers are hanging in there so it is hard to think about fall colors until it gets colder here. I love that center piece very cute. 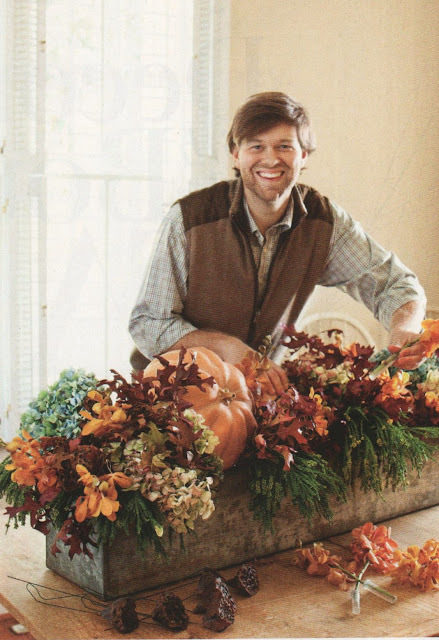 Great inspiration to kick off fall decorating. Debra, that looks great. I love window boxes and wish I had them outside, but would have to water daily here and I am too lazy. Good idea bringing one in. Oh my goodness, Autumn is in the air. You have put me in the spirit. Just wonderful. Stunning arrangement! I just love the colors you used! So soft! Your inspiration window boxes are really beautiful... but not as beautiful as yours! Debra, this is just beautiful! The colors are lovely! So pretty, Debra! Your inspiration pieces are wonderful too! I just love your dining room and the window box! Stunning fall display! Oh Debra! I totally adore your version!! I love how it is almost overflowing with fall goodness! Just so lovely! You have that fabulous eye for beauty, gal!! I love that you share it with us! Hope your week is delightful, my friend! That looks so beautiful Debra!! I love it! Debra, you have such a knack for decorating. Your flower box vignette is gorgeous, and yes, I definitely remember, "a really big shewwwww!" That is beautiful, I'm gonna pin it. Sooooo pretty, Debra. Love the muted fall colors and textures. Love your little cherub too but understand about him being so heavy. This is such a perfect fall look! I'll bet it is so much fun changing it up for the seasons. Oh, Debra, that is so gorgeous! Wow, it is huge, but you've done such a great job of decorating it! This looks wonderful. Gave me some ideas on what to do with my window box outside. So fabulous! I love how big this is and how you filled it with beautiful fall flowers and pumpkins...even if they are fake they still looks amazing! Stop by and link up to Centerpiece Wednesday on my blog and share this with us. Wow! Love this! Looks beautiful. Beautiful!! I'm your newest follower visiting from Savvy Southern Style! I think this is one of the prettiest fall centerpieces I have ever seen!! I just love it! It is so full and lush and beautiful!! Thanks for linking up...I can't stop admiring your window box and all this goodness! Thanks for linking up and sharing this with us. I love the idea of a window box on the table. You just change the contents with the season. This could solve some of my seasonal problems. Hmm...Thanks for the inspiration. It is LOVELY! Visiting from Simple & Sweet Fridays, the window box is stunning. The cherub looks perfect in his new location. What a wonderful way to get the fall started. Your window box looks stunning on your table. Your window box is amazing! I am so inspired by it! Would you mind if I posted a picture on my Facebook page? Love the arrangement in the window box with the white pumpkins and LOVE it as a centerpiece on your table!! Great idea and thanks for sharing!! Debra, Thank you so much for sharing this beautiful fall centerpiece. 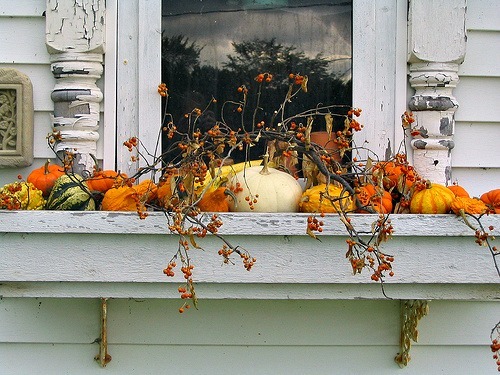 I love the white pumpkins and how it looks in the window box. Fall is here! I love this! I have a vintage bread bowl that I keep on my table....thank you for the inspiration! The centerpiece is exquisite Debra! Love the white box and pumpkins with leaves and ivy. Perfect! That looks fantastic Debra! Love it on your table. Thank you for joining Home Sweet Home! It's a beautiful box Debra. Thanks for sharing at Shabbilicious Friday. You are featured today at Potpourri Friday! Debra, Congrats you've been featured on Simple & Sweet Fridays for this beautiful window box. So pretty! These are all gorgeous! I used a 4 inch planter in my arrangement to hold the pumpkins up and I have heard that coconut oil is good to wipe on the leaves to refresh them. Oh Debra,your a rock star in my book! this Fall centerpiece is so pretty! I love your inspirations too. Thanks for joining me and sharing in the fun. Your centerpiece is stunning. LOVE it, and it's a great copycat! Wonderful job on your copycat! Yours looks fabulous on your table! I saw this picture of yours feature on a blog recently and I got some inspiration from it for a centerpiece I created and recently used for a tablescape!